The presence of several large and small scale companies has rendered the global phenoxyethanol market highly competitive. In a recent study, Transparency Market Research (TMR) finds that the vendor landscape in China is highly concentrated. In order to make a cut amidst fierce competition, most companies operating in the China market are going an extra mile to undertake scientific researches. Through this they are aiming at better safety and efficiency of their products. Furthermore, they are cautiously adopting strategies to let customers know about their efforts, in turn gaining traction for the global phenoxyethanol market. In the study TMR profiles some of the leading companies operating in the global phenoxyethanol market, which include BASF SE, The Dow Chemical Company, Ashland Inc., Procter & Gamble Co. (P&G), and others. Strategies adopted by these companies are likely to exert significant influence on the overall market. TMR studies growth trajectory of the market in details. As per the report, the global phenoxyethanol market will rise at a steady 4.9% CAGR between 2017 and 2025. At this pace, the market will reach US$260.3 mn by the end of 2025 as against US$170.3 mn in 2016. 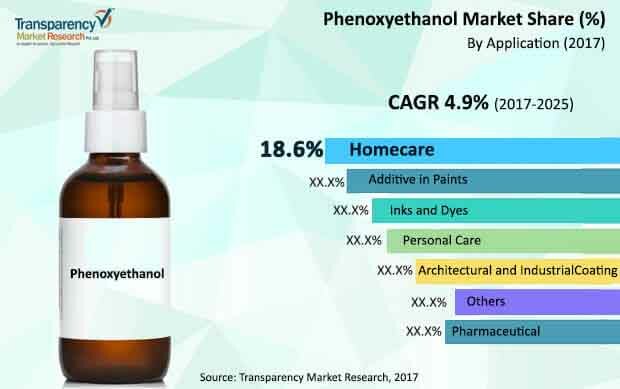 The increasing use of phenoxyethanol in home care, personal care, paint additives, industrial coatings, architectural coatings, inks and dyes, and pharmaceuticals is expected to boost the market over the forecast period. Among this, the homecare segment held a significant share in the market in 2017. Going forward it is forecast to exhibit rising demands for phenoxyethanol. Regionally, Asia Pacific held sway over the global phenoxyethanol market. The rising demand from China on account of its massive population and rapid economic development will help the market rise in Asia Pacific. Rising spending by consumers on discretionary items gives the biggest fillip to the global phenoxyethanol market. Given the scenario, growing disposable incomes will attract considerable opportunities for the market. Phenoxyethanol is supplanting formaldehyde donor preservatives in a fast and efficient manner, leading to their increasing application in personal care products. “Phenoxyethanol has excellent antimicrobial properties and can act against various microorganisms, which is why their use in both rinse-off and leave on personal care products has increased,” said a lead TMR analyst. Furthermore, phenoxyethanol is preferred due to its low sensitization, which has also earned it approval from around the world. In addition to personal care products, phenoxyethanol is also used as a solvent in cosmetic ingredients. In the coming years, the market is expected to witness rising demand from the cosmetic industry. Driven by this, it will exhibit a steady growth worldwide. Phenoxyethanol is also used as a preservative in cleaners due to its effectiveness against gram-positive and negative bacteria. Also, its application in active pharmaceutical ingredients has considerably increased and so has its use to anaesthetize ornamental fish during transportation. Despite its non-toxic nature, phenoxyethanol is associated with reproductive disorders, endocrine disruptions, and cancers. This is a key factor hampering the global phenoxyethanol market.